Pennsylvania has a rich, diverse higher education system that includes some of the top universities in the country, such as the University of Pennsylvania and Carnegie Mellon University. This system offers students an opportunity to find an institution that fits their learning style, whether it is a small liberal arts college or a large Ivy League university. Find out more about colleges in Pennsylvania using our search and comparison tool, discover what it actually costs to attend school in the state and learn about some of the most popular areas to earn a college degree. Pennsylvania is a state with a far-reaching higher educational system. The state is home to hundreds of universities and colleges that range from small religious-based institutions to large Ivy League Universities. After reviewing individual criterion for each college and university, such as graduation rates, student-to-teacher ratios and financial aid packages, we have compiled a list of the best Pennsylvania colleges. With such a variety of postsecondary institutions, it can be challenging for prospective students to wade through the number of colleges in Pennsylvania. To help with the decision-making process, students and their parents can use the search tool below to identify, review and compare colleges based on factors like acceptance rates, location, annual tuition and student body enrollment. The college planning process is vital for prospective students, regardless if they want to complete a career-focused program at a community college or a technical bachelor's degree at Carnegie Mellon University. This process typically includes finding a college, settling on a program of study, finding ways to pay for school and submitting a competitive college application. Numerous groups and organizations have launched statewide programs to help students in each step of the process. The Pennsylvania Association for College Admission Counseling hosts regional college fairs in both the spring and fall on local university and college campuses. Prospective students and their parents can meet with college admission representatives, learn about different academic programs and colleges, meet with enrollment coordinators and review services from vendors, such as scholarship organizations, state higher education lending programs, testing agencies and college preparation agencies. Ready to Succeed Scholarship Program is a statewide scholarship program administered by the Pennsylvania Higher Education Assistance Agency. Aimed at high-achieving students with family incomes at or below $110,000, this program awards up to $1,000 for part-time students and $2,000 for full-time students. The minimum scholarship award is $500. Funds can be used for tuition, books, fees, supplies and living expenses. To be eligible, students must meet Pennsylvania state grant requirements and be nominated for the scholarship by their university or college. The Partnerships for Access to Higher Education is a grant program for students attending college in Pennsylvania. This program awards additional funds to students who have received grant money from partner institutions of the Pennsylvania Higher Education Assistance Agency (PHEAA). To be eligible, students must demonstrate financial need, have received a Pennsylvania state grant, have received money from a PHEAA partner and be enrolled as an undergraduate student at an approved postsecondary institution. The award limit is $2,500 per academic year. Attending college can be expensive in Pennsylvania. Although tuition in the state system falls in the $7,000 range, according to Pennsylvania's State System of Higher Education, the average price of attending an in-state college and living on campus approaches $20,000. Students can use the charts below to get a realistic understanding of how much it actually costs to attend colleges in Pennsylvania and see how those colleges compare to average tuition rates in the rest of the country. When considering which college to attend, students should remember to factor in the total cost of attendance, which includes tuition and financial aid. 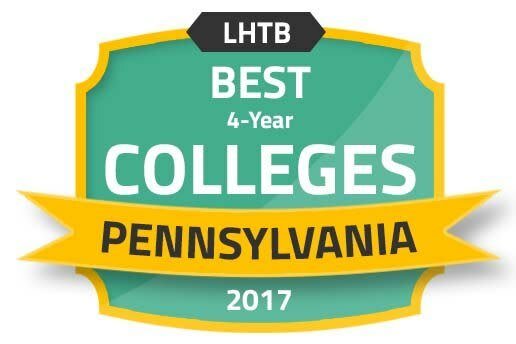 Below, we have put together a series of rankings of the colleges in Pennsylvania that offer students the most affordable college educations in the state. Prospective students should consider salary potential after graduation when choosing a college. After examining the career earnings of graduates from Pennsylvania colleges, we have put together a list of the schools that position alumni for the highest paying careers and a comparison of how those salaries stack up against national averages. Prospective students should be well aware of how much they will need to pay to earn their degree. According to the Project on Student Debt, Pennsylvania has the third highest rate of student debt in the country, averaging more than $33,000. To paint a clearer picture of affordability, we have compiled a list of the Pennsylvania colleges that produce graduates with the least amount of student debt. Pennsylvania ranks 34th nationally for overall cost of living, according to the Missouri Economic Research and Information Center When considering where to attend school, prospective students should consider the cost of rent, transportation, groceries and other related expenses in addition to tuition. The charts below offer a closer look of what it costs to live in the state's major metropolitan areas and how they compare to national cost of living rates. As students review potential colleges, they should look for a key term: accreditation. Accreditation is a voluntary review process of an institution's adherence to academic quality standards conducted by an independent third party. The Middle States Commission on Higher Education is the regional accrediting body for colleges in Pennsylvania. Beyond college-level accreditation, individual academic programs are also subject to accreditation reviews. Below are two examples of programmatic accrediting bodies in the state. Accreditation Board for Engineering and Technology (ABET) accredits undergraduate engineering degree programs at Carnegie Mellon University. American Psychological Association accredits the doctoral program in clinical psychology at the University of Pittsburgh. Along with healthcare, logistics and advanced manufacturing industries, the Philadelphia is becoming an entrepreneurial destination for technology start-ups. Not only is it an economic hub, Philadelphia also has one of the most vibrant and diverse educational systems in the country with 63 institutions of higher education in the region according to phila.gov. These range from small two-year colleges to private liberal arts colleges and from medical schools to midsize public universities. The Community College of Pennsylvania is an open-admission community college that offers more than 70 associate degree and certificate programs. Students can complete three types of associate degrees: Associate in Arts, the Associate in Science and the Associate in Applied Science. Major academic areas of study include liberal arts, science, technology, business, humanities, health, and social and behavioral science. There are nearly 15,000 students enrolled in a full-time status and another 28,000 taking credit classes. The college employs 395 full-time and 635 part-time faculty members. Founded in 1884, Temple University is a public, state research institution with a student body of nearly 38,000 students, with 28,408 at the undergraduate level and 9,380 at the graduate level. The university offers more than 2,000 full-time faculty teaching courses across 421 academic programs, which include 143 bachelor's, 132 master's, 58 doctoral and 68 graduate certificates. The university is also home to professional schools in dentistry, law, medicine, pharmacy and podiatric medicine. A leader in healthcare research, Temple Health is a $1.4 billion academic health system anchored by Temple University Hospital. A private Ivy League institution and America's first university, the University of Pennsylvania was founded in 1740. With an enrollment of 10,406 full-time undergraduate students and 11,035 full-time graduate/professional degree students, the university offers an impressive student-to-faculty ratio with an average of six students to each professor. The school provides four undergraduate schools and 12 graduate schools, including a school of dental medicine. Pittsburgh offers a high quality of life for its 304,000 residents. Although mostly known for manufacturing, the city is making inroads in technology, banking and healthcare. Academically, the city is a major higher education hub-headlined by nationally recognized Carnegie Mellon University-and home to both small and large public and private institutions. With 37 percent of its residents holding a bachelor's degree, it is a city that supports education and is an attractive location for attending college. A private research institution founded in 1900, Carnegie Mellon is one of the most highly rated universities in the country. Nearly 14,000 students from 114 countries are enrolled in academic programs in the university's seven colleges. In addition to its campus in Pittsburgh, the university also offers degree programs in nearly 20 locations around the globe. A community college with four campuses and four neighborhood centers, the Community College of Allegheny County has a massive enrollment. More than 27,000 students take credit-based courses, while nearly 18,000 take noncredit classes. Approximately 65 percent of students are enrolled in a part-time status. The college offers 152 programs of study divided across associate degree and certificates. Along with academic majors, students can also take classes focused on career, workforce, skill or trade. Founded in 1787, the University of Pittsburgh is a state research university with an enrollment of 23,730 full-time undergraduate students, 1,355 part-time undergraduate students, 7,577 full-time graduate students and 2,164 part-time graduate students. The university employs more than 4,400 full-time faculty members and has a 14-to-1 student-to-faculty ratio. Along with the central campus in Pittsburgh, the university has four regional campuses throughout the state. Students can choose from 100 undergraduate degree programs and more than 200 graduate and professional degree programs. Pennsylvania offers students additional resources to help with the college search. Below is a list of state organizations and nonprofits that help students with college planning, financial aid and college applications. Established in 1995, AICUP is a statewide organization that advocates on behalf of private higher education in the state and offers student scholarships through its foundation arm. An organization with memberships in the American School Counselor Association and Pennsylvania School Counselors Association, CPC offers free college planning workshops with a focus on financial aid as well as fee-based college preparation services to individual clients. This department manages the state's K-12 educational system, but also provides a range of resources for college students, including adult and career education programs, college planning resources and financial aid information. Founded in 1963, the PHEAA organization provides financial aid services to students, including loan servicing, loan guaranty and financial aid processing services. A membership-based organization of higher education professionals and educators, PSEA supports and advocates for education in Pennsylvania. This state education organization oversees 14 universities in Pennsylvania and provides college planning information, including individual university profiles for students and parents.